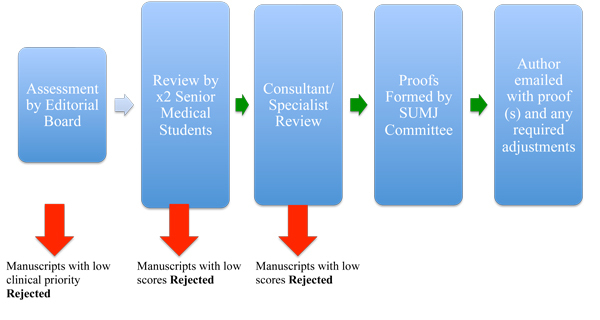 The SUMJ operate a three-tier double blind review process, with reviewers using a structured assessment form at each stage (see diagram). As a result of space restraints we have quite a high rejection rate for a student journal with only about 30% of articles being accepted for publications. We try to review articles in a prompt and effective fashion that generally takes 4-8 weeks after the closure of the submission deadline date. However, articles which are rejected in the first stage may hear back sooner than 4 weeks. Final articles (with changes in line with reviewer comments) need to be received at least one month before the publication date.